Knowing where to go to the bathroom and recognizing when to go are two different skills for a toddler. Here you'll find ways to make sure your Squirrel becomes an expert in both. Your Squirrel will want to continue the games, and you’re starting to combine that with real potty experiences. You’re going to need to help your Squirrel slow down enough to feel what her body is doing, but keep that fun level high with the games. So build upon the games you’ve established, this time bringing the games into the bathroom. Set the Time to Potty timer for every 30 minutes to help your child get in the habit of going to the bathroom. When your child is sitting on the potty chair or toilet, talk to him about what it feels like when you have to go to the bathroom. Talk about how your belly starts to feel a little full and might start to feel funny. Relate how it feels when you (ahhh) let out the pee or poop. 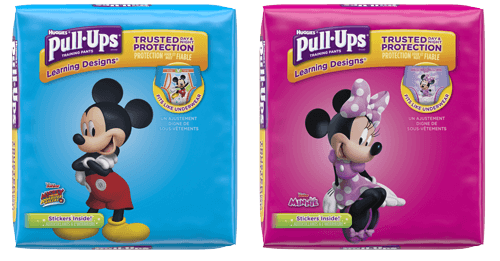 Help your child use Learning Designs® Training Pants to see when it’s time to for a change into clean Pull-Ups®. Tell her that whenever she sees the learning design has faded, she can talk to you about needing a change. After a while, your child will start to feel when his body tells him that he has to go to the bathroom. Cool & Learn® Training Pants provide a brief cooling sensation when your child wets to help you teach him the signs of when he needs to go. (Cool & Learn change temperature when your child has gone to the bathroom in them.) Families who choose Cool & Learn see it as a tool to help their child create the link between the brief cooling sensation, feeling wet, and going to the potty. Feel free to experiment with Cool & Learn if you prefer this approach!